“Picture two schools of fish swimming in clockwise and counterclockwise circles. It’s enough to make your head spin, and now scientists at Rutgers University-New Brunswick and the University of Florida have discovered the “chiral spin mode” – a sea of electrons spinning in opposing circles. “We discovered a new collective spin mode that can be used to transport energy or information with very little energy dissipation, and it can be a platform for building novel electronic devices such as computers and processors,” said Girsh Blumberg, senior author of the study and a professor in the Department of Physics and Astronomy in Rutgers’ School of Arts and Sciences. Collective chiral spin modes are propagating waves of electron spins that do not carry a charge current but modify the “spinning” directions of electrons. “Chiral” refers to entities, like your right and left hands, that are matching but asymmetrical and can’t be superimposed on their mirror image. The study, led by Hsiang-Hsi (Sean) Kung, a graduate student in Blumberg’s Rutgers Laser Spectroscopy Lab, was published in Physical Review Letters. Kung used a custom-made, ultra-sensitive spectrometer to study a prototypical 3D topological insulator. 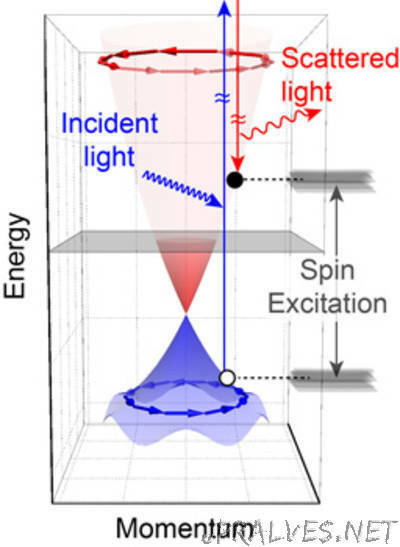 A microscopic theoretical model that predicts the energy and temperature evolution of the chiral spin mode was developed by Saurabh Maiti and Professor Dmitrii Maslov at the University of Florida, strongly substantiating the experimental observation. In a vacuum, electrons are simple, boring elementary particles. But in solids, the collective behavior of many electrons interacting with each other and the underlying platform may result in phenomena that lead to new applications in superconductivity, magnetism and piezoelectricity (voltage generated via materials placed under pressure), to name a few. Condensed matter science, which focuses on solids, liquids and other concentrated forms of matter, seeks to reveal new phenomena in new materials. Silicon-based electronics, such as computer chips and computers, are one of the most important inventions in human history. But silicon leads to significant energy loss when scaled down. One alternative is to harness the spins of electrons to transport information through extremely thin wires, which in theory would slash energy loss. The newly discovered “chiral spin mode” stems from the sea of electrons on the surface of “3D topological insulators.” These special insulators have nonmagnetic, insulating material with robust metallic surfaces, and the electrons are confined so they move only on 2D surfaces. Most importantly, the electrons’ spinning axes are level and perpendicular to their velocity. Chiral spin modes emerge naturally from the surface of such insulating materials, but they were never observed before due to crystalline defects. The experimental observation in the current study was made possible following the development of ultra-clean crystals by Rutgers doctoral student Xueyun Wang and Board of Governors Professor Sang-Wook Cheong in the Rutgers Center for Emergent Materials.